The concept of the journey spans cultures and traditions around the world. Journeys form the core of ancient and modern narratives, from the hero’s quest to the experience of life from birth to death. Lately, I’ve been thinking about the connection between the philosophical and functional aspects of the journey construct, and where a new understanding of the past and present might be possible. How might we build upon and extend the notion of the journey as a narrative framework for self development and growth within the context of information design and sensemaking? Going further, how might we expand the notion of information design to advance human potential? an indie game based on Joseph Campbell’s monomyth and the sentimental concept of unvoiced collaboration with strangers. The idea that at the end of the day, games are obligated to serve the purpose of “fun” above all others has been the main wrench in the works of the gaming industry’s machinations for legitimacy. Why should games be mature, cope with social issues, reflect society, or demonstrate the genuine artistic vision of a grown-up creator? At the end of the day, they’re just for fun, say gamers when they’ve run out of defenses against the mainstream industry’s embarrassing, stagnant homogeneity. Why remain locked in a market-safe model that indulges teenage male power fantasies with graphic violence and vicarious conquests? Why not push the medium to it’s fullest potential and experiment with new forms of interaction and experience — possibly new modalities of learning and understanding? Create timeless interactive entertainment that makes positive change to the human psyche worldwide. What a paradigm shift, and what an exciting frontier to explore! I don’t own a PS3, but if thatgamecompany continues to live up to their mission and push the boundaries of “interactive entertainment,” I may be persuaded to get one. 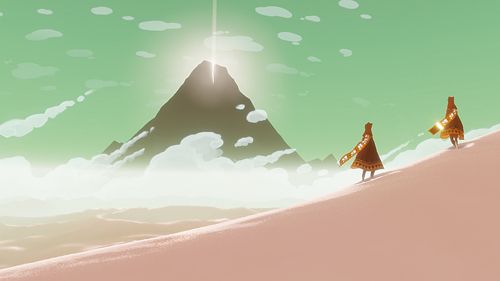 What Journey does so elegantly is tap into human themes of discovery and self-attainment and elevate them beyond the ordinary and the everyday: epic, dreamy landscapes, semi-familiar cultural references and symbolism, magic as a creative and communicative element, and best of all, the sound effects and music, masterfully composed and performed. Every design decision, from the color palette to the character design to the sound effects, enriches the visual and emotional texture of the game and demonstrates exceptional craftsmanship. Multi-sensory methods to amplify understanding and meaning – We’re only starting to understand what “online” means for information design, and the push towards sophisticated programming languages and visualization software is only uncovering part of the picture. Video games, by virtue of all that technology under the hood, immerse us in dynamic visual worlds, and even transport us away from our own time-space reality. How might we push video and audio even further, and how do we employ our other senses — and feelings — to enable understanding? Responsive and truly interactive experiences – The evolution from static to dynamic knowledge creation and transfer is still ongoing, yet there are opportunities to expand how we think about interaction and direct manipulation of information. What if visualizations moved beyond sliders, check boxes and toggles, and enabled fluid, intuitive exploration? How might we make information experiences less rigid and more responsive to enable instant feedback, physically and virtually? Personal change and growth – Commercial information design serves an important function, by helping people navigate spaces, learn new concepts and skills, and do their everyday work. But we could be thinking more about how information design thinking can support individual development and sense-making throughout life. My biggest gripe about information design is the “so what?” factor. Popular information design, in the form of “infographics” (or decoratively illustrated lists of facts) and abstract data displays appeal to the eye and may enable some understanding, but what happens next? The metaphorical notions of “consumption” or even “digestion” seem to be the end state for information design these days, but if we carry the thinking further, are we metabolizing that information and is it fueling any action? How might we nourish the intellect and the individual, instead of just manufacturing visual confections and feeding appetites? How might we focus on outcomes instead of just outputs? The more I reflect on this topic, the more I feel that information design should embrace a greater purpose. It continues to prove its value to businesses and organizations, but it can — it must — also benefit individuals and society as a whole in deeper and more engaging ways. But to accomplish that doesn’t require more content to be formatted and displayed or more data to be mined and filtered through analytic software and spit out onto slick futuristic interfaces. The “new” and widely untapped frontier that awaits information design is a refocus on maximizing human agency by enabling and expanding what people can be and do in their lives. The journey that lies ahead for information design should not be guided solely by technology, market trends, or passing fancies. The journey should be grounded in what matters most to people and their lives — their struggles, their aspirations — and it should be guided by understanding, from within the realm of understanding-based professions and from without. Cooperation, collaboration, and a respect for the timeless, universal things that bind humanity will help guide the way forward.